Holy Land USA is a Waterbury theme park celebrating the story of the Bible. 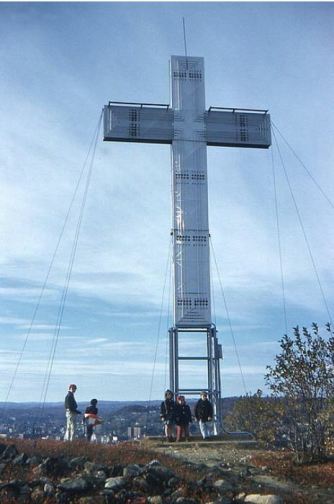 Made conspicuous by its giant cross overlooking Interstate 84, the park once attracted tens of thousands of visitors every year to the Waterbury area. Begun by Catholic activist John Greco in 1956, Holy Land USA fell victim to neglect and abandonment in the 1980s. Greco was a Waterbury native and first-generation Italian American who studied to become a priest at St. Thomas Seminary in Bloomfield and St. Mary’s Seminary in Baltimore, Maryland, before graduating from Yale Law School and entering the legal profession. In the 1930s, he founded the Connecticut chapter of the Catholic Campaigners for Christ and, in 1956, decided to take his message to the public through the creation of a religious theme park. 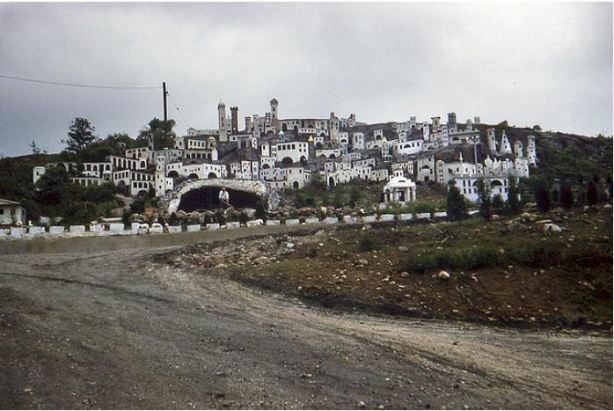 Greco began spending his free time up on Pine Hill, where he and other volunteers built more than 100 buildings to recreate a Biblical vision of Jerusalem and Bethlehem. The plywood and plaster structures depicted such sites as Herod’s Temple and the manger where Christ was born. 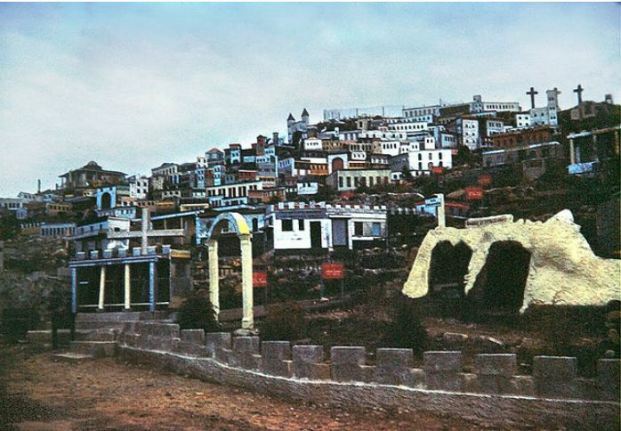 To complement the buildings, Greco added yellow-painted golden calves, a cast-metal Christ on a cross, an exhibit on the Holy Shroud of Turin, and catacombs extending underground for 200 feet. Representations of Biblical figures and Catholic saints consisted of everything from high-quality European statues to old plastic mannequins. 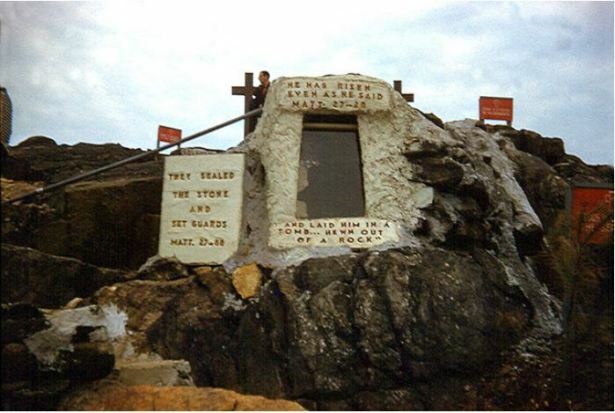 During the height of its popularity, Holy Land USA attracted over 40,000 visitors per year. Greco, who lived on the property, welcomed guests as he preached God’s love through a megaphone and led visitors through the various attractions. As Greco’s health deteriorated in the 1980s, Holy Land USA fell into disrepair and Greco closed the attraction in 1984. Upon his death in 1986, having found no one willing to maintain the park, Greco left the property to an order of nuns known as the Religious Teachers Filippini. Weather and vandalism continued to take their toll, however. Numerous efforts to revitalize the park came and went without success, including attempts developed by Hartford Archbishop John Whealon in the 1980s and the local Knights of Columbus in 2000. In 2013, however, Waterbury mayor Neil O’Leary (along with friend and local businessman Fred Blasius) purchased the property and began raising money for Holy Land’s restoration. The help of numerous volunteers and the donation of a new, internally lit 57-foot cross allowed Holy Land USA to reopen to the public in September of 2014, even as the renovations continued.